NOTE: This is the non-touch controller edition of the game designed specifically for Android TV, including two-player local co-op support. A controller (one for each player) is required to play. This edition will not work with most mobile phones and tablets. The touch control edition designed for phones and tablets will be available on June 23rd, 2016. Join Nuna and Fox as they search for the source of an eternal blizzard that threatens the survival of everything they have ever known. Guide both characters in single-player mode or play cooperatively with a friend as you trek through frozen tundra, leap across treacherous ice floes, swim through underwater caverns and face enemies both strange and familiar. (NOTE: An Android-compatible game controller, such as the Nvidia Shield Controller, is required to play and two controllers are required for local co-op play). 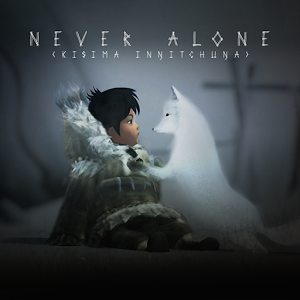 On over 75 “Best of 2014” lists, and winner of “Best Debut Game” at the 2015 BAFTA Games Awards as well as “Game of the Year” and “Most Significant Impact” at the 2015 Games for Change Awards, nearly 40 Alaska Native elders, storytellers and community members contributed to the making of the game. You’ll explore awe-inspiring environments, perform heroic deeds, and meet legendary characters from Iñupiaq stories — all narrated by a master storyteller in the spoken Iñupiaq language. The rich and atmospheric arctic environments of Never Alone are best experienced on Nvidia Shield devices.